Hooligan fishing is a growing phenomenon in Alaska and we have several local river that offer amazing hooligan fishing opportunities. Each year in mid to late May local rivers in the Anchorage area begin to teem with these small smelt locally known as “hooligan”. You must be an Alaska resident to fish for hooligan. Hooligan Fishing in Anchorage has become more popular but most of the places to catch them that you can drive to just don’t offer the numbers that the Big Susitna river does. We take you by boat to a place you can experience a Hooligan Run in Alaska that you won’t soon forget. 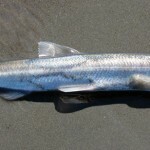 Hooligan (Thaleichthys pacificus), otherwise known as “eulachon” or “candlefish”, are a type of anadromous smelt that makes its way into a number of rivers in Alaska during the spring spawning run. The name candlefish comes from their oily composition and the fact that people used to render the oil from these fish to burn and use for light. Legend has it that people used to dry these fish and light their tales on fire to use them as candles! They migrate in select rivers in the hundreds of thousands. the run typically takes around 5 to 7 days then it’s over until next year. More an more people are getting in on Hooligan fishing and are enjoying eating them. People have learned to cook hooligan in many different ways and for those who enjoy them they are a delicacy. There are many hooligan recipes available. You can look online to find ways that people cook these little fish. We only run hooligan charters during the peak of the run within a 20 minute boat ride up or down the Big Susitna River from the Deshka Landing. If you call to book a hooligan charter we will put you on a list and call you when the run begins. 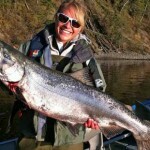 We will be running the river everyday on king salmon fishing charters and will monitor the run. Once the hooligan run hits our area we usually have 5 to 7 days of good hooligan fishing before the run has gone by.